Ullr "Wulþuz" (the glorious one) is a beautiful god within the Æsir that would best be described as a warrior and ruler among gods. Associated with archery and snowshoes/skiis, Ullr is a major god, however, much of his lore is lost. His ring is an ultimate symbol to swear oaths upon; his place of refuge Ýdalir the holy forest of Yew trees; and the number of places named after him within Norway and Sweden give credence to his place within traditional germanic paganism. The son of Sif and stepson of Thor, Ullr is invoked in times of glory: a duel, a silent place in the forest, a grand hunt. Due to the small amount of information we have on Ullr, we should not make the mistake of building upon our sources to name him as specifically a winter god or just a god of archery, but rather these things make up aspects of the god Ullr. The gods are something that we as man must strive for physically and metaphysically; even though Ullr is to us in the modern age of small significance, the traits he displays must be respected akin to the other gods. The theonym of Ullr comes from the early germanic "Wulþuz, wolþu" -- which means glory but also wool. On the Thorsberg chape (the end metal of a sword scabbard), found in the moor of Thorsberg, the name "owlþu" also appears as the chape is inscribed "ᛟᚹᛚᚦᚢᚦᛖᚹᚨᛉ / ᚾᛁᚹᚨᛃᛗᚨᚱᛁᛉ" in runes, phonetically "owlþuþewaz / niwaje͡mariz". When moving to the continental Germanics and Latin we see "Ollerus" (stemming from the fat extracted from sheep's wool [PIE's root 'wele' + Latin's 'oleum' (oil, fat) ]) while the Old English is "Wuldor". Wool (as in the sheep's wool product) comes as well from the same source of proto-Germanic "wulno" (source also of Old Frisian "wolle", Middle Dutch "wolle", Dutch "wol", Old High German "wolla", German "wolle", Gothic "wulla") and from proto-Indo-European "wele". If we follow the strain of "wele" from PIE we also see "wele-nes" (to strike, wound), the same root word that conjugates Valhalla from proto-Germanic "walaz" (Old English "wæl" (slaughter, bodies of the slain), Old High German "wal" (battlefield, slaughter)). However, the root and not the rest of the word that forms Valhalla is used from höll "hall," from PIE root kel "to cover, conceal, save." This means Ullr is seperate in etymology from hiding, covering, a hood such as Höðr the blind god who shoots Baldr. Within a similar PIE root "wel" ( meaning wish or will, [Old English "wela", West Germanic "welon"]), forms the middle English word "wele", modern wealth for "happiness, prosperity in abundance of possessions or riches". Ullr's homestead Ýdalir (Yew Dales) comes from Old English "iw", "eow" (source also of Proto-Germanic "iwo", Middle Dutch "iwe", Dutch "ijf", Old High German "iwa", German "Eibe", Old Norse "yr") and from proto-Indo-European "ei-wo". PIE "ei" (to go) is a root associated with the honorific "count" as well as ambition, ambience, coitus, commence, praetorian, and many other words with the same direction as 'going somewhere'. The Yew tree itself symbolizes both death and immortality, being poisonous as well as long-lived. Shakespeare wrote Macbeth to concoct a poisonous brew which included "slips of yew, silvered in the moon's eclipse" which fortells the coming death of the character clearly. The Yew tree is also the most notable wood for the making of bows. The wood of the core and heartwood being soft while the sapwood is hard and can withstand heavy tension. There are many other sources and historical facets of the yew to cover in a religious context that includes the other branches of PIE mythology, but for the purpose of this article, they will not be discussed here. Ullr heitir einn, son Sifjar, stjúpson Þórs. Hann er bogmaðr svá góðr ok skíðfœrr at engi má við hann keppask. Hann er fagr álitum ok hefir hermanns atgervi. Á hann er gott at heita í einvígi. Ullr is the name of one, who is a son of Sif, and a step-son of Thor. He is so good an archer, and so fast on his skis, that no one can contend with him. He is fair of face, and possesses every quality of a warrior. Men should invoke him in single combat. Then went the Æsir to their feast, and the twelve Æsir who were appointed judges seated themselves in their high-seats. These are their names: Thor, Njord, Frey, Tyr, Heimdal, Brage, Vidar, Vale, Ullr, Honer, Forsete, Loki. The broad planks rent asunder. Hvernig skal kenna Ull? Svá, at kalla hann son Sifjar, stjúp Þórs, öndurás, bogaás, veiðiás, skjaldarás. How should Ullr be periphrased? By calling him Son of Sif, Stepson of Thor, God of the Snowshoe, God of the Bow, Hunting-God, God of the Shield. On our arms, where sits the falcon. Vápn ok herklæði skal kenna til orrostu ok til Óðins ok valmeyja ok herkonunga, kalla hjálm hött eða fald, en brynju serk eða skyrtu, en skjöld tjald, ok skjaldborgin er kölluð höll ok ræfr, veggr ok gólf. Skildir eru kallaðir ok kenndir við herskip, sól eða tungl eða lauf eða blik eða garðr skipsins. Skjöldr er ok kallaðr skip Ullar eða kennt til fóta Hrungnis, er hann stóð á skildi. Á fornum skjöldum var títt at skrifa rönd þá, er baugr var kallaðr, ok eru við þann baug skildir kenndir. Weapons and armor should be periphrased in figures of battle, and with reference to Odin and the Valkyrs and host-kings: one should call a helmet Cowl, or Hood; a birnie, Sark, or Kirtle; a shield, Tent; and a shield-wall is termed Hall and Roof, Wall and Floor. Shields, periphrased in figures of warships, are called Sun, or Moon, or Leaf, or Sheen, or Garth, of the Ship; the shield is also called Ship of Ullr, or periphrased in terms of Hrungnir's feet, since he stood upon his shield. On ancient shields it was customary to paint a circle, which was called the 'ring,' and shields are called in metaphors of that ring. As a tooth-gift in ancient times. verða of ása sonum, þá er hefja af hvera. If the kettle aside were cast. By the horse of the rest-bed, | and the ring of Ull. Hunc itaque, ne publicam religionem exsulare cogeret, exsilio multantes Ollerum quendam non solum in regni, sed etiam in divinitatis infulas subrogavere, tamquam deos ac reges creare in aequo positum foret. Quem licet perfunctorie flaminem creavissent, integro regum honore donabant, ne alieni officii procurator, sed legitimus dignitatis adverteretur esse successor. Et ne quid amplitudinis deesset, Othini quoque ei nomen imponunt, vocabuli favore invidiam novitatis exclusuri. Quo denis ferme annis divini senatus magistratum gerente, tandem Othinus diis atrocitatem exsilii miserantibus satis iam graves poenas dedisse visus squaloris deformitatem pristino fulgoris habitu permutavit. Iam enim superioris infamiae notam medii temporis intervallum exederat. Exstitere tamen, qui ipsum recuperandae dignitatis aditu indignum censerent, quod scaenicis artibus et muliebris officii susceptione taeterrimum divini nominis opprobrium edidisset. Sunt qui asserant eum quosdam deorum adulando, quosdam praemiis permulcendo amissae maiestatis fortunam pecunia emercatum fuisse et ad honores, quibus iam pridem defunctus fuerat, ingentis summae pretio reditum comparasse. Quos si quanti emerit rogas, illos consule, qui quanti divinitas veneat didicerunt; mihi minus constare fateor. Igitur Ollerus ab Othino Byzantio pulsus in Suetiam concessit, ubi veluti novo quodam orbe opinionis suae monumenta restaurare connisus a Danis interfectus est. Fama est, illum adeo praestigiarum usu calluisse, ut ad traicienda maria osse, quod diris carminibus obsignavisset, navigii loco uteretur nec eo segnius quam remigio praeiecta aquarum obstacula superaret. So, not wishing Odin to drive public religion into exile, they exiled him and put one Oller (Wulder?) in his place, to bear the symbols not only Of royalty but also of godhead, as though it had been as easy a task to create a god as a king. And though they had appointed him priest for form's sake, they endowed him actually with full distinction, that he might be seen to be the lawful heir to the dignity, and no mere deputy doing another's work. Also, to omit no circumstance of greatness, they further gave his the name of Odin, trying by the prestige of that title to be rid of the obloquy of innovation. For nearly ten years Oller held the presidency of the divine senate; but at last the gods pitied the horrible exile of Odin, and thought that he had now been punished heavily enough; so he exchanged his foul and unsightly estate for his ancient splendour; for the lapse of time had now wiped out the brand of his earlier disgrace. Yet some were to be found who judged that he was not worthy to approach and resume his rank, because by his stage-tricks and his assumption of a woman's work he had brought the foulest scandal on the name of the gods. Some declare that he bought back the fortune of his lost divinity with money; flattering some of the gods and mollifying some with bribes; and that at the cost of a vast sum he contrived to get back to the distinction which he had long quitted. If you ask how much he paid for them, inquire of those who have found out what is the price of a godhead. I own that to me it is but little worth. 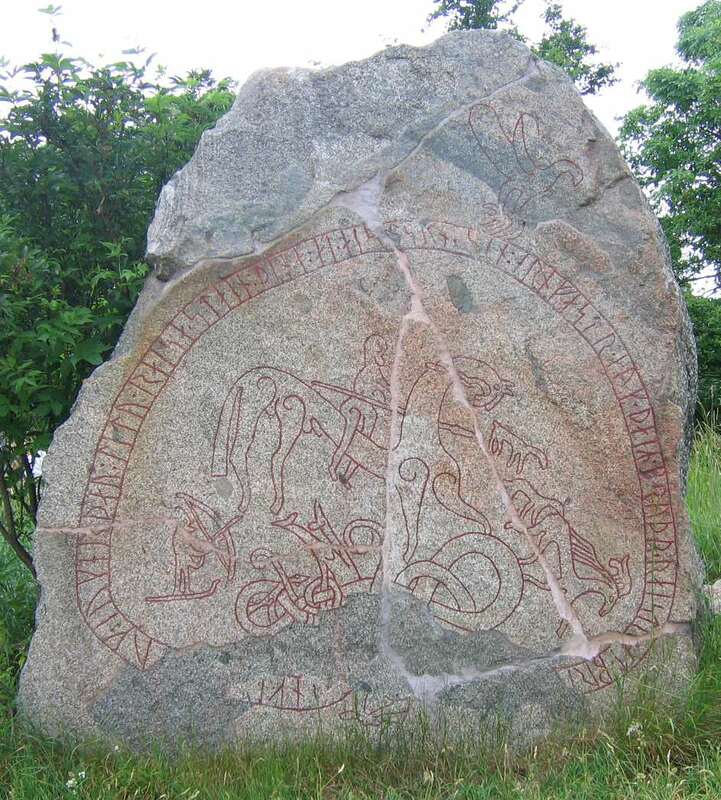 Thus Oller was driven out from Byzantium by Odin and retired into Sweden. Here, while he was trying, as if in a new world, to repair the records of his glory, the Danes slew him. The story goes that he was such a cunning wizard that he used a certain bone, which he had marked with awful spells, wherewith to cross the seas, instead of a vessel; and that by this bone he passed over the waters that barred his way as quickly as by rowing.